By Chris Williams on July 11, 2014. I was intrigued when I saw the above question on the Internet. I have to disagree with the answer that was provided by the “MAD Scientist,” a medical student. He said that wasps were attracted to car grilles because of the heat which wasps identify with a predatory animal. The wasps are looking for a way to sting the grille “animal” that they believe is threatening their nest. Whoa, that’s pretty far fetched. First, I don’t know that wasps around car grilles is a major problem. In fact, this is the first I’ve heard of it so I suspect it doesn’t happen often. Approaching this with entomological knowledge, I think there are two reasons why the scenario might occur. 1) Wasps are nesting under the hood of the car and entering and exiting through the grille. It would be important to know the type of wasp. It’s very possible for some wasps, paper wasps especially, to start a nest under a car hood. Other wasps could begin a nest in this protected location, too, but nest building is more likely to happen if the car sits unused for long periods of time. 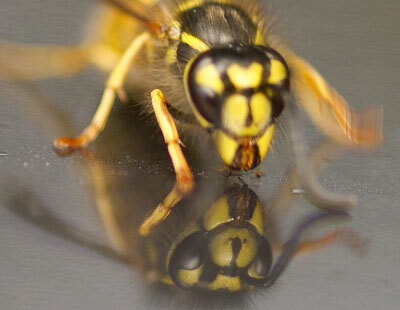 2) Wasps are visiting the car grille to pick off dead insects. Most wasps collect insects to feed to their young in the nest. Some specialize in spiders but many, like yellowjackets, will take what they can get. Usually, wasps attack living insects, but some are not so picky. Yellowjackets, in particular, will readily pick up dead insects when they find them. Yellowjackets are scavengers which is why they are so annoying at picnics. They even scavenge on animal carcasses, chewing off bits of meat, and carrying them back to the nest. Just a reminder: Don’t believe everything you read on the Internet. Consider the source. Does this person have credentials as an expert in the field? If not, there is plenty of information that is from experts. For regional pest control information, start with your state’s Cooperative Extension Service. The National Pest Management Association also provides pest information you can trust at pestworld.org.